What's the Risk of Using Unsupported Software? It turns out you are really the key when it comes to running unsupported software safely. 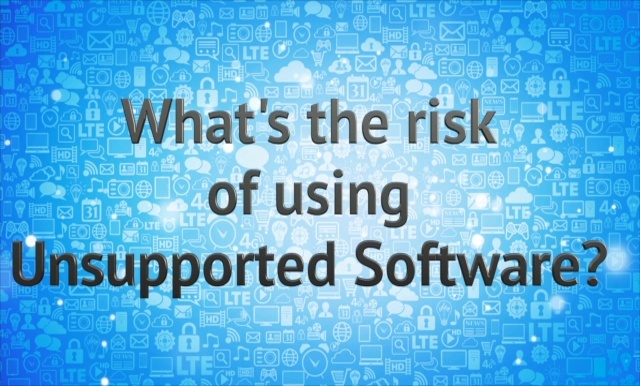 Continue Reading: What's the Risk of Using Unsupported Software? I am trying to fix a computer that has malware preventing me from getting into regedit and task manager. It will not let me boot into safe mode. It will not let me install any anti-spyware or anti-virus software. I'm not sure where to go from here. It has stopped me from doing much of anything to get the malware off the computer. Any suggestions? Sadly, this is all too common. Malware can be pretty sophisticated, and it can work hard to prevent you from removing it. That means you may be blocked from downloading or running anti-malware software, or be prevented from running tools already on your machine that might help. I'll save the "prevention is so much easier than the cure" missive for a moment. We just want this fixed. There are things that we can try, but unfortunately, there are no guarantees. Continue Reading: How Do I Remove a Virus If It Prevents Me from Downloading or Installing Anything? I recently took an update via Windows Update, and after doing so, my machine wouldn't even boot. It took a technician hours to get it working again. That's not something I can afford to have happen again. I'm avoiding Windows Update from here on out. Continue Reading: I Got Burned by Windows Update. Should I Just Avoid It? Is Evernote Secure Enough For Financial Documents? A virus is a computer program written by someone, with the presumed intent of spreading and causing grief. Like a human virus, a virus makes the infected computer "sick": it causes poor performance, crashes, lost files and data, or more. "In reality, if you can educate yourself, if you can start to feel comfortable about being able to determine what is and what isn't safe to do on the internet, you can probably continue to use Chrome for quite some time, probably until it's time actually replace the machine for other reasons." - I kinda disagree with this. Education and caution provide no protection from things like malvertising/drive-by downloads/installs - which, as we've seen recently, can be propagated via even well-known and reputable websites. "Seriously, a backup is by far the number one way to protect yourself from just about anything." - I kinda disagree with this too. Much of the malware that's out there today is financially motivated and designed to steal banking passwords/credentials, etc. Sure, a backup may - or may not - enable you to get your computer back to a pre-infection state but, by that time, your passwords and personal information could be long gone. When it comes to OSes, browsers and browser plug-ins, the only good option is to use products that are supported. Using something that isn't supported could result in you getting an unpleasant surprise when you next check your bank balance. One thing that often happen when any software become unsuported on a given platform is that, although it continue to get devlopped and probably continue to work, it's no longer been tested on that platform. This may have no impact on you, but it can also mean that, after any update, that application may no longer work, or work erraticaly. Here, Chrome is no longer been supported on Vista. So, the peoples working on Chrome no longer have any computer running Vista to test it on. The next update or version may or may not work correctly. Some addons and extentions may also fail to work properly or at all. Thunderbird is still being supported in that they are fixing any discovered bugs. What they are not doing is adding new features. From all of the complaints I've been reading from people about changes in Windows and other products, this is probably a good thing. No new features means no frustration learning a new interface and fewer bugs cropping up. "I don't use 'cloud' for much of anything" Actually, you do. All email is a cloud service. When the well seems empty and you're running out of ideas, there are many strategies to find more things to consider.